Early Career Conference Grants are open to early career academics employed by ACU member universities, enabling them to participate in a conference held in any country other than their country of employment. Grants are intended to give the opportunity to participate in international conferences to early career academics without previous international experience. 30 grants will be available in 2019. At the time of application, applicants must be employed in an academic (research and/or teaching) role by an ACU member institution. Applications are open to university staff who are less than ten years from the start of their employment in an academic role. Academic staff who have recently returned to work after a career break can also be considered: applicants to whom this criteria applies should make this clear in their application. Applicants must not have previously worked or attended an academic conference outside their home region. The conference to be attended must be a recognised academic conference in a field relevant to the applicant’s area of expertise in a country other than the applicant’s country of employment. Applicants must give full details of their chosen conference at the time of application. Applications will be strengthened by the applicant providing evidence of the submission/acceptance of a paper or poster, or other communication with the conference organisers. Proof of a paper submission/acceptance or other communication must be attached to the application form. The grant must be used to participate in a conference between 1 June 2019 and 31 December 2019. Applications to attend conferences outside these dates will not be successful. The maximum amount of each grant is GBP 2,000. Grants can be used to cover travel and visa costs, conference fees, accommodation and subsistence. Applicants must provide a letter of support from their head of department. Successful applicants will be responsible for arranging any required visa as well as making their own travel arrangements. Grants will be paid in a single instalment to a nominated individual at the grant holder’s home institution. Grant holders must provide an account of expenditure and a brief report on how their grant has been spent. The ACU aims to achieve a regional and gender balance in selections. The ACU reserves the right to publish the names of successful applicants on the ACU website and in ACU publications. 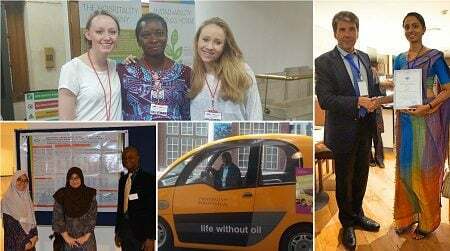 Next articleUNFCCC Global Climate Action Communications Internships 2019 – Bonn, Germany.